STUDENTS and staff from Royal Opera House Thurrock Trailblazer schools gathered together at the High House Production Park in Purfleet on Thursday 24 January to plan a carnival. Five students and two teachers from six schools took part in workshops to learn carnival skills led by outdoor arts organization Kinetika and carnival arts group Kinetika Bloco. Carnivals will take place in the schools, who are also invited to join the Tilbury Carnival procession on Saturday 20 July. The different themes chosen by each school celebrate the diversity of Thurrock. During the day of carnival preparation, three workshops were run in carnival drumming, dance and design. 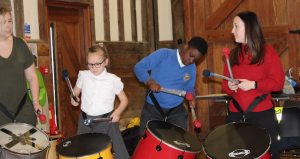 Artists from the internationally renowned and Purfleet-based outdoor arts organization Kinetika led the design workshop, and carnival performance group Kinetika Bloco led the drumming and dance workshops. 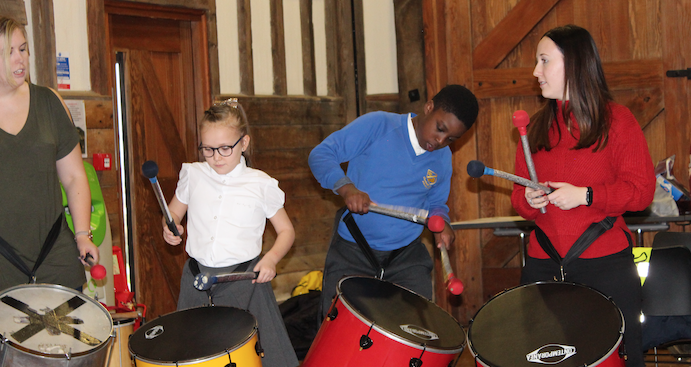 The students learnt samba reggae rhythms and created their own individual compositions using a range of carnival drums. They learnt some mass-movement, repeated dances and had the opportunity to choreograph their own adaptation, creating shapes based on these movement patterns. They learned to think about travelling choreography, which is necessary for a carnival procession. Kinetika’s Artistic Director Ali Pretty and artist Ray Mahabir helped the students decide on the story and characters for the carnival. Building upon initial ideas on the theme of carnival and using recycling as the main source of inspiration, the workshops explored ways to use recyclable products and items that would otherwise be thrown away to create costumes. The Royal Opera House Thurrock Trailblazer schools involved were Chadwell St Mary, Deneholm, Stifford Clays and Holy Cross Primary Schools, and Aveley Academy and William Edwards Academy. Royal Opera House Thurrock Trailblazer provides pupils with access to high-quality arts and cultural activities provided by the Royal Opera House and other cultural organizations. Working with the Royal Opera House Learning and Participation team, each school creates a year-long calendar of cross-curricular creative activities tailored to their school’s needs. The programme can include any art form: creative writing, visual arts and design, drama, dance, music, singing, film and photography.